Feels like weeks since I’ve been here. I keep meaning to write something, then I get distracted by something else that has to be done. We’re in the final stages of production of The Dears album, and I’m pretty much completely psyched about it. Also, I’ve been working on my science fiction novel which is coming along nicely but is a real drain on the wordsmith portions of my brain. Thus, explaining my absence here. Saturday night, just before bedtime, my daughter pulled out three of her stuffed bears and asked me to make two of them some clothes so they could be more like the third, red-shirted Winnie the Pooh. I’ve made low-rent bag-shirts out of felt for her bears before, so I told her we could do it in the morning and sent her off to bed. First thing Sunday morning I was requested to make good on my word and produce aforementioned bear clothes. Really? I negotiate to have coffee and breakfast first and decide to go for it: I busted out the sewing machine. I did not go for it that far, since I didn’t bother trying to change the colour of the bobbin thread. Gauche, I know. I was instructed to make two shirts: one blue and one yellow. 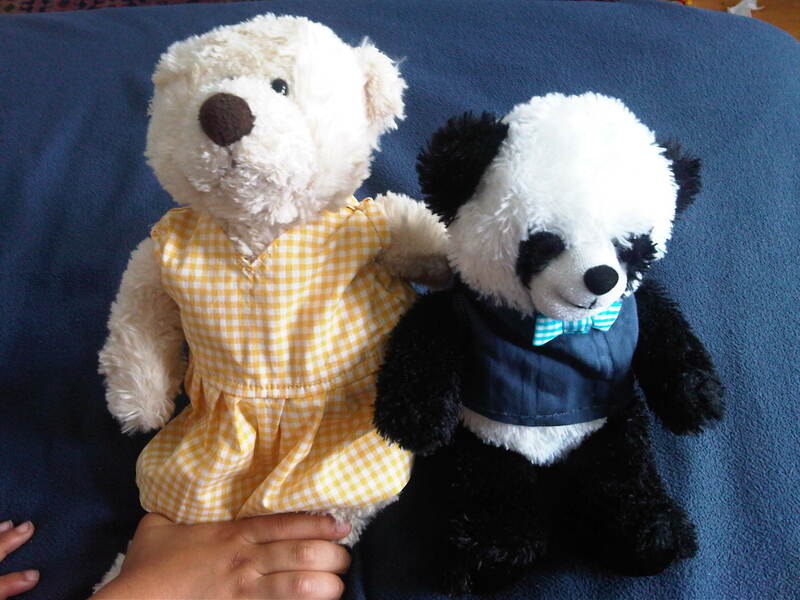 I found scraps of fabric I’d used for other projects and started in, first making a blue shirt for the panda bear (accented with a bowtie made from gingham Mokuba ribbon). After making the yellow vest for the second “Snowy” bear, was feeling a little confident and added a skirt with ruched front. That’s right. From scratch, patternless, using mismatched threads and crappy scissors.